De Anza College President Brian Murphy on April 9 announced plans to retire at the end of the academic year, after leading one of California’s most distinguished community colleges for the past 14 years. He made the announcement in an email to all faculty, classified professionals and administrators. “I am enormously proud of the dual commitments to educational excellence and social justice that define the college,” Murphy said. “The work of faculty, classified professionals and administrators has been marked by an uncommon attention to both individual students and the broader dynamics of inequality that frame Silicon Valley. During his tenure, Murphy promoted initiatives to recruit students from historically underserved populations, while combining those efforts with innovative services to help students succeed at De Anza. He also helped to instill a passion for social justice and civic engagement at the college – which has an enrollment of more than 20,000 students from diverse backgrounds across Silicon Valley – and led the campus through a period of expansion that brought new buildings, renovations and updated educational technology to the campus. Murphy, 73, has been only the third president in De Anza’s 50-year history. Previously holding the role were founding president Robert DeHart, followed by Martha Kanter, who became chancellor of the Foothill-De Anza Community College District before serving as U.S. Under Secretary of Education in President Barack Obama’s administration. 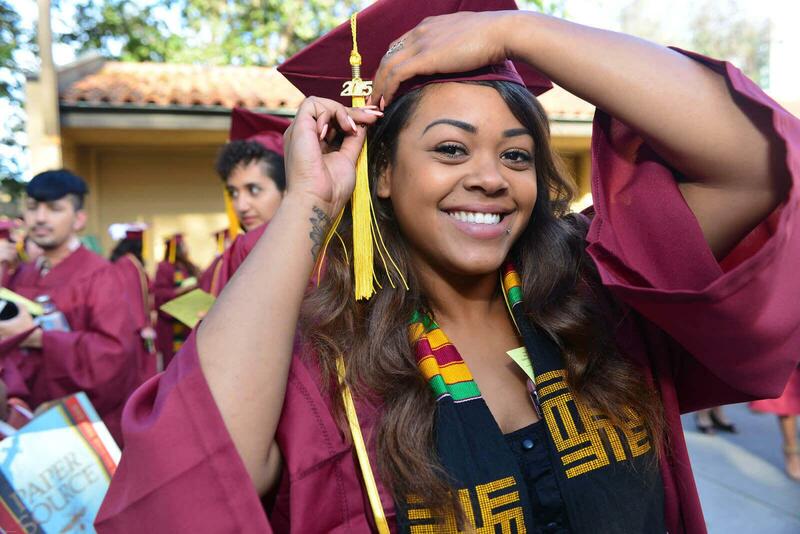 With Murphy’s leadership, De Anza College has consistently continued to rank among the top community colleges statewide for students who successfully transfer to four-year schools, where they can earn bachelor’s or advanced degrees. De Anza also has been recognized for its career technical education (CTE) programs, in which students have demonstrated significant achievement in earnings and other measures of economic progress. These initiatives led to significant expansion of De Anza’s Office of Outreach and Relations with Schools, which works with high schools throughout the valley to recruit new students – many of whom are the first generation in their families to attend college – and to support them as students at De Anza. The strategic initiatives also spurred the creation or expansion of student success programs, including Learning Communities that provide a network of academic support for students with a common background or interest. The emphasis on equity included an expansion of the college’s former Diversity Office – now the Office of Equity, Social Justice and Multicultural Education – and an embrace of equity goals by programs across campus. In 2008, De Anza was in the first group of six U.S. colleges and universities to receive a federal AANAPISI grant as an Asian American and Native American Pacific Islander Serving Institution. Murphy also initiated a campus effort that led to creation of a new Institute for Community and Civic Engagement. Then-English instructor Rowena Tomaneng, now president of Berkeley City College, and child development education instructor and former Academic Senate President Mayra Cruz were founding co-directors of the ICCE. In 2015, the institute was renamed the Vasconcellos Institute for Democracy in Action (VIDA) in honor of late state Senator John Vasconcellos. VIDA, now led by faculty director Cynthia Kaufman, works to help De Anza students become community leaders and active participants in a democratic society. Its programs include California Campus Camp (formerly Campus Camp Wellstone), which provides training in grassroots politics and organizing; the Public Policy School, co-sponsored with the Political Science Department to give students first-hand experience in legislative advocacy; HEFAS, which offers peer support for undocumented students; and Community Service Learning, which coordinates student learning opportunities with off-campus service organizations. Through VIDA, the college offers a Certificate of Achievement in Leadership and Social Change, which prepares students to work in fields such as public policy, labor, social justice or the nonprofit sector. In 2011, Murphy advanced his vision for civic engagement to a national level by co-founding The Democracy Commitment, a coalition that fosters civic engagement programs at 200 community college campuses with a combined enrollment of more than 2.3 million students in 27 states. Murphy, who has served on boards and steering committees for regional, national and international education groups, gave a talk about De Anza’s civic engagement work during a 2012 conference at the White House. Murphy also presided over a significant improvement and expansion of campus facilities during his tenure, including the construction of the Media and Learning Center (MLC) and the Visual & Performing Arts Center (VPAC). Most of the construction was funded with community support through Foothill-De Anza district bond measures E and C, which also helped pay for significant renovations of the Library, the Stadium and other facilities. De Anza was the first community college in the nation to develop a campuswide Sustainability Management Plan. The college now has nine buildings that are LEED-certified as meeting environmentally sustainable standards. Before coming to De Anza, Murphy was the executive director of the San Francisco Urban Institute at San Francisco State University, a senior adviser to the California State University chancellor, and chief consultant to a state legislative Joint Committee for Review of the Master Plan for Higher Education. In this role, he was the chief negotiator for the landmark legislation, AB 1725, which established the role and structure of today’s California community college system. Murphy holds a doctorate and master’s degree in political science at the University of California, Berkeley, and a bachelor’s degree in political science from Williams College.